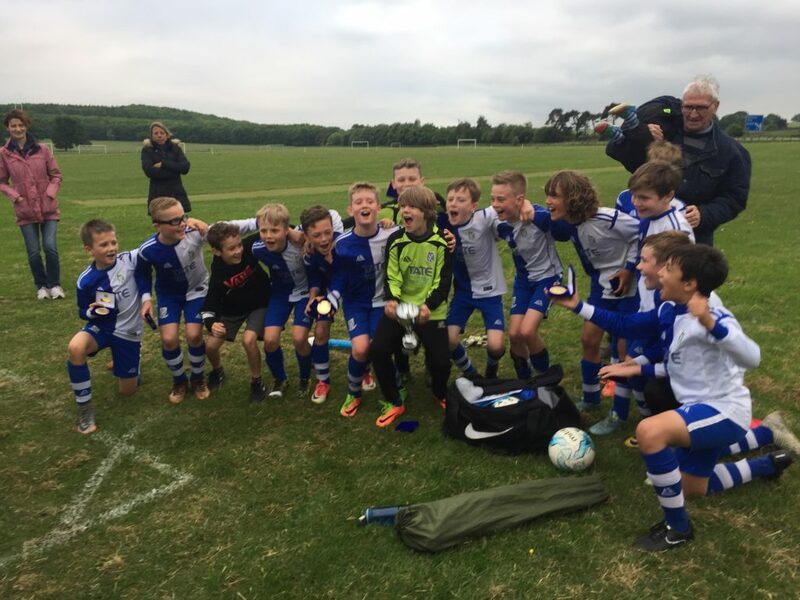 U10s finally played their League Cup final on an immaculate Grange Park playing surface, deservedly recording 4 wins out of 4 to lift their second cup of the season. U17s topped the division after beating Garforth Villa 1-0 in a nerve-wracking title decider. Hearts were in mouths in the final minute when we gave the ball away in our penalty area and withstood a frantic goalmouth scramble to deny Garforth the goal that would have handed them the title. Peter Arnett's last match as U13s Dynamos manager saw us struggle in a scrappy first half but turn things around after the break and produce a stellar performance to win the game 2-0. U15s finished the season with a 3-3 draw away at Wigton Moor. In an entertaining game we opened the scoring only to concede to a free header from a corner and then a breakaway goal to go into half time 2-1 down. A defensive error helped us back into the game, only to see Wigton Moor almost immediately restore their lead. With 10 minutes remaining we scored a deserved equaliser to end our season on a run of three games unbeaten. An unusual Tuesday evening fixture for the U15s, at home against Ripon. Two own goals by the opposition helped us to a 5-3 victory, our first league win since March 17th. Silverware for the U16s, who beat Garforth Rangers 2-0 in the Final of the Barkston Ash Cup. U18s completed their season with a 2-1 win against Knaresborough Celtic to secure 3rd position in the League table. Although having the majority of the possesion in the first 45 minutes, Deighton only really tested the keeper once when a low shot from Jake Swift was pushed round the post. However, KDR improved after the break and were rewarded when Sam Monaghan converted a penalty after Miles Lowson had been brought down in the box. Deighton extended their lead when Alex Diggle found Callum Unsworth on the right wing who played a superb diagonal pass for Jacob Hann to score against his former club. There were several other clear chances for Rangers to extend their lead but Jake, Miles and Harry Clinker all missed great opportunities to score. Typical of KDR U18s this season, the last few minutes were tense as firstly goalie Rowan Bentley kept out what seemed like a certain goal only for Knaresborough to then score with 5 minues remaining. With composure recovered, Deighton were able to see out the match and win 2-1. The Kirby Builders Merchants man of the match award went to James O'Sullivan with Rowan Bentley the runner up. U10s Girls Kangaroos played their first 7 a side matches against Clifford. Missing a couple of strong players, we lost one game and drew the second. Gala day at Grange Park. U8s fielded two teams, with a combined record of 6 wins (3 each), 3 draws and a solitary defeat. Despite this neither side made it beyond the group stage. U14s finished the season with a 0-0 draw in a well matched game at home to Beckwithshaw. U15s lost 5-2 away at Pannal Sports, picking up a yellow card in the process. This gives us the dubious record so far this season of 2 points, 3 yellow cards and a red card from 11 games. U17s played Guiseley in the Styan Cup. 3-0 down after 20 minutes, we pulled it back to 3-3 at the break, and eventually ran out 9-5 winners. Knaresborough Celtic await in the final. U10s Girls Kangaroos took part in the monthly league gala, held on Ilkley's astroturf pitches. The girls looked a little rusty, but gave a good account of themselves, scoring some cracking goals in the process. U13s Girls Dragons included a couple of debutants in a friendly away at Scarborough. We recorded our first victory over our opponents, coming back from 2-1 down to win 3-2. U10s played Wigton Moor in the League Cup semi-final. Against very tough opponents we recorded two wins and two draws, scored 10 goals and conceded just one, and progressed to the final. In a complete reversal of yesterday's performance, U12s played some good football against Bardsey. We peppered their goal with shots, but to no avail, and went down 1-0 to a deflected cross. In their first match since the beginning of February, U13s Dynamos faced the unbeated league leaders Pannal Ash Hawks. We trailed 2-1 at the hour mark, but then wilted in the heat and conceded three goals in the last 10 minutes. U14s lost 5-0 away at Wigton Moor. Despite some good performances (goalkeeper Jake Levine saved a penalty, and man of the match Arthur Marshall never gave up chasing the ball), a spell early in the second half when we conceded three goals in quick succession was our undoing. .
U15s beat Tockwith 4-0 in a friendly fixture. Unfortunately our first win for over a month was marred by a red card and some poor on-field behaviour from some of our players. U16s played some excellent football in a 4-1 win over Yorkshire Amateurs. U17s played against Garforth Villa, the only team who can prevent us winning the league. A slow start saw us 2-0 down after 20 minutes, but we then woke up to level the game by half time. In a dominant second half performance we scored three without reply. Final score 5-2, and only one game remaining, away at Garforth Villa! U9s played some good football at home against Pannal Sports, but we failed to convert our chances and lost all four games. U12s played high-riding Ilkley. Too many below-par performances saw us succumb to a 9-0 defeat.U13s Girls Dragons played a friendly against Garforth Rangers from the West Riding League. The first half looked to be ending in stalemate until we opened the scoring just before the break. We played much better in the second half, cantering to a 7-0 win. U14s played Beckwithshaw on a poor playing surface. In an end-to-end game a good fighting performance saw us get a 3-3 draw. A rare midweek match for the U9s away at Leeds City Juniors, on one of the hottest days of the year so far. The tropical temperature and our lack of match fitness (this was only our second competitive match this year) contributed to a lack of urgency on the field, but we still came home with four wins from four games. U16s were also catching up on postponed fixtures, with two consecutive games against Knaresborough, winning 1-0 and losing 3-1. U8s played Pannal Sports Tigers at the Stray in Harrogate, on a ground that was so wet that it was not possible to take corners on one side of the pitch. The ensuing water polo match resulted in two wins for us and two for the opposition. U12s worked hard against Leyburn but were unable to turn effort into goals. A couple of mistakes saw us go down to a 3-1 defeat. U14s gave their all against second placed Tockwith, but were beaten 3-0 by the better side. U17s played Ripon in a friendly, went 3 goals up and then lost focus, allowing the opposition to come back for a 3-3 draw. U18s were far from their best in losing 4-1 away to Wigton Moor U17s in the Styan Cup. After a fairly even start, Wigton took the lead after 16 minutes when KDR could not clear a freekick into the area and the ball was prodded home from inside the box. However shortly afterwards, James O'Sullivan produced the best goal of the match when cutting in at pace from the right wing and blasting an unstoppable shot into the roof of the net. Wigton retook the lead after 33 minutes when a cross along the 6 yard box line was unfortunately turned into his own net by Tom Pearson. The second half belonged to Wigton who capitalised on defensive errors by Deighton to finish as deserved winners. The Kirby Builders Merchants Man of the Match award for KDR went to Tom Megginson for a determined display at centre half. U13s Girls Dragons played away at Brayton Belles in the League Cup semi-final, a team we had previously beaten 2-0 and 1-0 in the league encounters. It was a terrifically entertaining and competitive game, and once again our defence was unbreached, with Brayton failing to register a single attempt on goal. Unfortunatly we failed to convert any of our chances, and the dreaded penalty shoot-out ensued. We converted 3, but Brayton scored from 4 of their penalties, so no cup final this season. U10s played away at Pannal Ash in their second cup competition of the season. Two wins, two draws, no goals conceded, and a game agaisnt Wigton Moor in the semi-final to come. U11s were on a high after a shock victory against the U12s the previous day. Unfortunately they failed to take the winning mentality to Knaresborough, and were soundly beaten 8-1. Our goalkeeper was the Man of the Match. U12s responded more positively, playing some good football to beat Beckwithshaw 1-0, having lost twice to the same side already this season. U16s played their second and third games of the weekend away at Pool. A 1-0 defeat in the cup was followed by a 2-0 defeat in the league. U9s played competitively for the first time in over a month away at Pannal Ash, and it took a couple of games to get back up to speed. The second set of games were closer, but some defensive errors saw us come home with four defeats out of four. U13s Girls Dragons played a friendly against Carlton Minniott. It was an opportunity to give some of the newer girls a run out, and to field some players in different positions. We lost an entertaining game 1-0 to a late goal, but could have come away with a win had we converted some of our half dozen one-on-ones with the Carlton keeper. U16s dominated against Nidd, but could only manage a 1-1 draw. U10s produced some outstanding football against Pannal Ash in the Cup, progressing to the next round with three wins and a defeat. U17s played only their second competitive fixture in eight weeks against Ilkley. Despite having only 10 players and facing a stubborn Ilkley defence for an hour, eventually the floodgates opended and we ran out 4-1 winners. U11s lost 8-1 away at Pannal Sports in the Cup, undone by a combination of poor discipline, poor defending and poor shooting. U13s Girls Dragons welcomed South Park Rangers from Teeside for the League Cup quarter final. The opposition belied their lowly league position and took the lead after 4 minutes with a near post header from a corner. They were much stronger opponents than expected, but our girls battled hard and scored two quick goals – both from close range following up parried saves form the South Park keeper. It was a really entertaining end to end match. Both teams hit the crossbar, and as time ran down South Park pushed more and more bodies forward and it needed some solid defending and a flying fingertip save with minutes to go to keep KDR in front for the 2-1 win. U10s won three and lost one game against Otley, who turned up with just 11 players for two 7 a side games. U13s Kinetic ended the league season, and also their 9 a side career with a 4-2 win away at Beckwithshaw. We hit the bar three times and forced the Beckwithshaw keeper into some great saves. U14s played Wigton Moor in the League Cup on a very cold and windswept Soldier's Field. A poor start saw us gift the opposition three goals before half time. After the break a fine long range effort reduced the arrears, and we spurned a couple of good chances before conceding again. Final score 4-1 to Wigton. U15s lost 4-1 to Collingham in a Cup match at Grange Park. In a mad five minute spell around the half hour mark we conceded three times, then pulled a goal back before half time, only to concede again early in the second half. Both teams then managed to miss numerous chances. Also in the Cup U16s beat Helperby 4-0. U17s went out of the Cup with a 3-0 defeat against table-topping and unbeaten Grassington. It was the first game for six weeks and it showed. U18s drew 1-1 away at Nidd Utd. Although dominating possession in the first half, Deighton failed to capitalise and missed three glorious chances to score (including a 'miss of the season' contender) to leave the game goalless at half time. KDR started the second half promisingly and scored soon after the restart when Alex Diggle collected the ball in his own half, dribbled past two players and played a through pass for Colum Fletcher to calmly finish. However a controversial equaliser followed when Rangers goalkeeper Rowan Bentley was barged whilst attempting to catch a cross with the ball ending up in the net and a goal given. The dispute about this unsettled KDR's composure and gave motivation to Nidd who finished the stronger of the teams with Deighton grateful to Tom Pearson for a goaline clearance to keep the scores level at full time. U7s played in a friendly tournament with Wetherby and Clifford. Despite being without three of our stronger players we won four games , drew two and lost twice. U13s Girls Dragons played their last league game of the season, a dead rubber against 2nd placed Wigginton. Lacking four regular key players we started poorly and after 10 minutes Wigginton took the lead with a simple ball over the top. This woke the girls woke up and they began playing football, but despite being the better footballing team we snatched at our chances and didn’t force the Wigginton keeper into a meaningful save. The second half was much better until we thought we were Man City and tried to pass our way out from defence. A scramble ensued and they got their second. And so our unbeaten run came to an end. U18s won 5-0 at home against Nidd Utd. Although Deighton dominated possession in the first half, clear goal scoring chances were few, with the only goal coming from a quality piece of play as James O'Sullivan sprinted past two defenders on the right wing and delivered a perfect cross for Colum Fletcher to volley home from close range. KDR were lacklustre at the start of the second half until a missed chance for Nidd to equalise seemed to spurr Rangers into life and Greg Moodie in particular as from his own half he went on a solo run and unleashed a powerful shot to score from the edge of the penalty area. Shortly afterwards, Nidd were unfortunate to concede a 3rd when a shot from Greg that was going wide was deflected into the net by a defender. Deighton's control of possession now started to tell, with Alex Diggle hitting the crossbar and then Jack Townsend unlucky to see his shot come back off the post. The pressure told however when Tom Pearson added a 4th goal with a shot to the corner of the net and then shortly before full time, another shot from Greg hit the crossbar, bounced down onto the goalline and KDR striker Harry Clinker was quickest to react to poke the ball home. The Kirby Builders Merchants Man of the Match award went to Callum Unsworth. U12s played Catterick in a 'must-win' bottom of the table clash. We took an early 2-0 lead courtesy of a couple of sublime goals, only for Catterick to fight back and take a 4-3 lead just before half time. The boys dug deep, scored an excellent equaliser, then two more to record a 6-4 victory. Despite hitting the bar twice and forcing some good saves from the goalkeeper, U13s Kinetic performed well below par, going down 4-0 to Wigton Moor. U14s played away at Burley in Wharfedale in a cold, biting wind and a very heavy pitch. Despite being reduced to only 11 players due to late (half term related) player withdrawals we took the lead early in the game. Unfortunately we then contrived to award the opposition three very charitable goals. Add to that a heavy tackle leaving us with just 10 fit players. The boys pulled their fingers out and deservedly clawed the game back to 3-3 at the break. In the second half our injured player returned to the fray, albeit sore, and bolstered our midfield. But then another goal given away, and we were 3-4 down. ​With only a few minutes to play, a good team move presented a ‘must-score’ opportunity, but the ball went wide of the goal, and 3-4 the score remained. U18s won 4-2 at Ilkley in a lively match. From the start, Deighton had the clear majority of possession but missed two good chances to score within the space of a few minutes, when first Jack Townsend blazed a shot over the bar when clean through and then Josh Quinn could not beat the keeper in a one on one. To compound this, Ilkley responded with a quick break down their left wing and a cross to the far post was headed in to put KDR 1-0 down. Greg Moodie was unlucky to see his long range shot tipped over the bar by the Ilkley keeper before Deighon's pressure finally told in the 37th minute when an unselfish square ball by Sam Monaghan was finished by Colum Fletcher. KDR started the second half well and scored three times in just 10 minutes. A perfect cross from James O'Sullivan was powerfully headed home by Colum, Sam scored with a curling shot from the edge of the box and then Alex Diggle headed home from James' corner.To their credit, Ilkley battled back and pulled a goal back in the 70th minute with a long range shot that flew into the Deighton net. For a while, Ilkley threatened to score more goals and KDR were indebted to Callum Unsworth for a goal-line clearance and keeper Rowan Bentley for a great one on one save. However the introduction of substitutes Harry Clinker and Jordan Nugent swung the match back in Deighton's favour who finished the stronger of the teams.The spirit of the match was marred by two red cards in the final minute, an Ilkley player for landing a punch to the face of Deighton's Miles Lowson and (harshly) Miles himself for retaliation. U11s played their first 9 a side matches away at Ripon, and struggled with the larger pitch, larger goals and offside rule, going down to a heavy defeat. U13s Dynamos climbed off the bottom of the league with a gritty 2-0 win over Ilkley at Grange Park. A superb long range strike and a half volley from six yards out did the damage. The added bonus was a clean sheet from our man of the match in goal, but a great performance from all 9 lads who gave it their all.​ U13s Kinetic played Ilkley at home, and went in 4-0 up at half time with four excellent goals. We lacked the same sparkle and cohesion in the second half and conceded a goal. Final score 4-1. U15s were away at Burley, a team that beat us 12 - 0 at home in November. Got off to a poor start conceding a 25 yard wind assisted screamer after just two minutes. We equalised to go in 1-1 at half time, but unfortunately conceded a good individual goal and then a third when we were chasing the game. Despite losing 3 - 1 it was a massive improvement on November's scoreline. U7s played Pannal Ash Reds in a bit of a breeze. A win, a draw and 2 narrow defeats and more than one example of good passing moves.​ U8s got off to a flying start against Pannal Ash Blues, storming into an early lead. However they were unable to maintain the momentum, but still came away with two wins, a draw and a defeat. U13s Girls Dragons travelled to bottom club York RI knowing a win would put them in an unassailable position at the top of the league. KDR took the lead within the first two minutes and were two up after ten. York RI adopted a very attacking formation which put us under pressure for the rest of the first half but the defence remained resolute. We changed formation in the second half - a half we completely dominated - playing some sublime attacking football. The third was scored with 15 to go and we got two more in the final few minutes to win 5-0. Cue dancing and spraying champagne (well lemonade) as the girls celebrated becoming KDR's first ever female league champions. They have won 12 and drawn one, scored 56, conceded only 4 and kept 10 clean sheets. U9s played against Knaresborough and won all games convincingly. A great effort from all the boys. U8s played away at Knaresborough Celtic and after a long break from active duty the boys got off to a good start with a win and a draw in the first two matches. Good passing and width down the wings was apparent in these games. Unfortunately the boys then decided to forget all this and lost the next 2 matches. U10s produced their best performance of the season against Clifford, with four wins from four matches​.​ U11s were not helped by player absences and lost all four games against Beckwithshaw. After a poor performance the previous weekend U12s played some really good football to draw 1-1 with Pannal Sports. U14s Blues played Pannal ​at home, having lost the previous encounter 9-1. Two well matched teams played an entertaining match. We were solid at the back and everyone gave 100% effort. Some good football saw us win 3-1.​ U16s fell behind three times against Wigton, but eventually prevailed to win 4-3. The first half of the U17s game against Wetherby saw our worst performance of the season. Down 2-1 at the break, the second half saw a vast improvement, with the final score 7-2 in our favour. A rousing fightback gave U13 Girls Dragons a 2-1 victory against Poppleton and kept their unbeaten record for the season intact. The girls have now played 12 games this campaign, winning 11 and drawing only one, leaving them clear at the top of the City of York Girls league. But things did not go all their own way as they kicked off 2018 against a well-organised and determined Poppleton side. Despite playing some nice football, KDR's rustiness of not having had a match for six weeks showed as they wasted a number of early chances. Poppleton made the most of their early fortune and took the lead against the run of play when the ball broke kindly for their striker to slot home. The lead did not last long however, and KDR top scorer Eva Jenkins levelled matters when she pounced on a poor goal-kick to smash the ball into the net. KDR continued to create chances and dominate possession but were thwarted by some dogged defending and the width of a crossbar as Poppleton survived to half-time. The second half continued in much the same vein as the first with KDR providing most of the running going forward and looking strong at the back. However, Poppleton held firm and their goalkeeper made a number of good saves to deny the home side. It was a very frustrating morning for U13s Boys Dynamos. The boys went a goal up against Wetherby with a thumping header and dominated the first half with shot after shot just going wide or being saved. Wetherby equalised through a disputed goal. The second half saw us smash one against the post and then against the crossbar before a series of unreal deflections from a Wetherby shot saw the ball hit the post and just make it over the line with our keeper and defender both lunging at a ball that evaded the pair of them. U18s lost 6-0 away at Ilkley but the scoreline was harsh and does not reflect the match which was actually a feisty, competitive game. Ilkley had the benefit of some marginal refereeing decisions and were 2-0 up after 20 minutes but Deighton responded well and were unlucky not to score before half time, particularly when a cracking shot from James O'Sullivan hit the bar and a header from Alex Diggle came back off the post. In the 2nd half Ilkley's finishing for two more goals was top class (curling shot into the corner and powerful shot that flew in) whereas KDR's was not - and with the game lost a couple of formation reshuffles to try and get a goal didn't work out to leave the end result 6-0. U14s played their first match as a single squad since the merger of the Whites and Blues teams, overcoming Leeds Maccabi 5-1 at Grange Park. U17s beat Wigton Moor 7-2. U16s and U18s were both in County Cup 3rd round action. U16s were on the receiving end of an 8-1 defeat against Rothwell. U18s lost 4-2 against Harrogate Railway. KDR had the better of the first half with three clear cut chances to score but none of these produced a shot on target. Deighton's bad luck was compounded in the last minute of the first half when a strong tackle from a KDR defender led to a ricochet off a team mate into the net for an own goal. That seemed to inspire Railway who performed much better in the second half and raced into a 4-0 lead but to their credit Deighton fought back with the last two goals of the match, a penalty by Alex Diggle after he had been brought down in the box and then a precise low shot into the far corner of the net by Jake Swift. U10s played away at Pannal Ash Blues in the cup semi-final away. The boys stepped up and did the business, winning two games, drawing one and losing one by a single goal. They are now through to the final, having knocked out Wigton Moor, Pannal Ash Reds and Pannal Ash Blues along the way. U8s were not at their best against Killinghall, missing too many chances to score, losing twice, drawing twice and recording only a single win. U13s Dynamos celebrated their first win of the season with a 3-1 victory over Knaresborough Celtic. 2-0 up at half time, the second half saw Knaresborough halve the deficit after a superb move, then they were awarded a penalty which was brilliantly saved by our keeper at full length. A quick break later, one touch football, a dazzling bit of wing play found our striker at the back post and two goal advantage restored. U13s Kinetic beat Ripon 4-1 to jump above them in the league. U14s Blues started poorly at home against Bedale, going in three down at half time. The second half only got worse, and we ended up losing 10-0. U16s came back from a goal down to win 3-1 at Ilkley, taking us up to second place in the league. U18s drew with Ilkley Town Blues in a thrilling 4-4 game at Grange Park. Deighton had the better of the early play and got the goal they deserved after 10 minutes when Sam Monaghan shot low into the bottom corner of the net. But Ilkley were level just 5 minutes later when a long ball into the KDR box was spilled by the goalkeeper. Rangers then again took the lead when a pass from defence by Luke Kilby found Jake Swift who released Sam to calmly curve his shot into the far corner.KDR increased their lead after just 2 minutes of the second half when James O'Sullivan broke down the right wing and his shot was deflected into the goal. However with the wind behind them, Ilkley came roaring back scoring three times in quick succession to take the lead. It looked as though Deighton had thrown it away until in the final seconds of the match, Jordan Nugent robbed the ball from the Ilkley full back and crossed for Sam to equalise with his hat-trick. The Kirby Builders Merchants Man of the Match award went to Sam Monaghan. U7s were away at Pannal Ash. It took the boys until the last two minutes of the last game to warm up and spring into life with a five-piece passing move and a shot onto the top corner. It was a tiny goal and only our first (and last) of the day but nevertheless celebrated by all boys. U10s played a very tough fixture against Pannal Ash in the quarter final of the cup, winning the first two games, losing one and then drawing the last game despite peppering the Pannal goal with shot after shot. On to the semi-final next week. Mixed results for the U13s. Dynamos lost 8-0 to the league leaders Pannal Ash Hawks,Kinetic won 4-0 away at Pannal Sports Panthers. A really good performance from the whole Kinetic side, showing excellent attitude and fitness. Star player was Matty Harman, who switched from left back to striker, scored two and almost got four more. ​U15s lost 12-0 at home against Burley. U16s played really well and won by the only goal in a fairly even match with Wigton to go third in the league. U17s won 4-2 at Guiseley. U18s drew 2-2 away at league leaders Bedale in a game of two halves. Deighton dominated the early play and got the goal they deserved after 19 minutes when Luke Kilby intercepted the ball in defence and played a long diagonal pass to the right wing where James O'Sullivan controlled with a great first touch, sprinted past the full back and crossed for Jack Townsend to score from close range. But the lead lasted less than 3 minutes as Bedale equalised with a header from their first corner. KDR continued to have the clear majority of possession but could not score and were disappointed not to be ahead at half time. However the second half saw a spirited fight back by Bedale who took the lead with a long range shot which flew into the roof of the net. It was now the home team who dominated and Deighton were indebted to goalkeeper Rowan Bentley on several occasions for keeping the lead to just one goal. KDR finally began to rally in the closing stages and after Greg Moodie had a seemingly goal bound shot tipped round the post by the Bedale keeper, from the resultant corner Alex Diggle headed powerfully into the top corner of the net to earn the draw. The Kirby Builders Merchants Man of the Match award went to Rowan Bentley. U9s suffered their first defeats of the season against Clifford. Both teams were asleep for the first five​ minutes and then started to play some good football. By this time it was too late as our defence had already been breached. The last two thirds of the games saw us throw away chance after chance, plus Clifford had two fantastic keepers who made terrific saves. U8s played away at Clifford, one of the better teams in our league, and came away with 3 wins, 2 draws and 4 defeats. U14s Blues were at home against Burley. A poor first half saw us 3-0 down at half time but we came out fighting in the second half and got back to 3-2 with two goals from Matt Hill. More goals looked on the cards, but a breakaway saw Burley get a fourth with minutes to go. U17s played in bright sunshine at a chilly Ilkley. Our football was laboured in the first half with a host of missed chances but we still managed to go in 2-0 up at half time. A better second half saw us canter to a 9-0 win. ​U18s played away at Harrogate Railway on a poorly marked pitch with a 2:30 kick off and very low sun. A closely fought contest throughout saw the scores level 2-2 until the 85th minute when a disputed free kick to Harrogate led to a third goal, after which our heads went down and we conceded a fourth from a weakly defended corner. The goals were scored by Josh Quinn and Miles Lowson with the Kirby Builders Merchants Man of the Match​ award going to Greg Moodie. U7s and U8s both played in tournaments at Leeds United's Thorp Arch training ground. U7s came away with a few wins under their belt, U8s won some, drew a couple and lost some, but more wins than defeats. A great effort from both groups. U10s played previously unbeaten Wigton Moor in their first ever cup game, and produced a fabulous team performance to win 3 out of 4 games, only losing the fourth game to a single late goal. Also in the cup​ U11s played Beckwithshaw at home. Despite missing a number of players for various reasons, the boys gave their best but were unable to win any of the four games. County Cup 2nd round action for a number of teams today. U12s lost 3-2 to Skipton, U14s Whites went down 8-0 away at a very good Ossett side. U16s weren't at their best but still managed to overcome Ilkley 5-0. U18s also progressed to the next round without kicking a ball, after their opponents withdrew from the competition. In the league U13s Dynamos ​faced Pannal Sports Lions with some trepidation, having lost 8-2 to the same team at the beginning of the season. A much improved performance today saw us get a 2-2 draw, and it could have been a win as we hit the post and forced the Pannal keeper to make a great save with only minutes left to play. U13s Kinetic were drawing 1-1 at half time away at Wigton Moor, but eventually lost 4-1 to a team that will be in contention for the title. U15s game against Pannal Sports was an evenly matched contest for the first 55 minutes. Then with the scores at 1-1 we capitulated and gave away a number of silly goals to finish lose 6-1. It took 40 minutes and the loss of a goal to wake up the U17s away at Wetherby. A much improved second half saw us dominate and take the match 3-1. U12s Girls Rockets beat Beckwithshaw 4-2 to remain unbeaten in the league so far this season. The score was 4-1 at half time but we were unable to add to our tally in the second half, and conceded a soft goal with the last kick of the match. U13s Girls Dragons played second bottom Scotton Scorchers, and despite dominating the game and missing chance after chance the score was still 0-0 with 15 minutes left to play. But then we finally breached the Scotton defence and the floodgates opened. Six more goals in the last 10 minutes gave us a 7-0 win. Played 7, won 7, 32 goals scored, none conceded, top of the league and playing some really good football. Another frustrating weekend for the U12s, losing 4-1 to Nidd. U14s Blues were overrun by a stronger, faster Pannal side, losing 9-1. U16s gave away a two goal lead against Pannal Sports, losing 3-2. U17s were 2-0 and cruising against Amaranth, but went to sleep to allow the opposition to get a 3-3 draw. U12s lost 3-1 to Ripon. U14s Blues dominated the game against Ripon, with some good passing. But an inability to finish cost us dearly, and we lost 3-0. U17s had only 9 players available for the game against Guiseley, but a dogged performance helped us draw 2-2. On a perfect day for football U8s played Beckwithshaw at Grange Park. A determined performance resulted in one win, two draws and a defeat. U9s took on Scotton Scorchers in a friendly fixture, coming home with two convincing wins to maintain their 100% record this season. U10s were not at their best but still managed to get 3 wins and a draw against Ripon Panthers at home. U12s were roundly beaten 10-0 in the Barkston Ash Cup by a very strong Garforth team, but can count themselves unlucky not to have scored on more than one occasion. Despite the scoreline the boys never stopped chasing the game. U13s Dynamos produced their best football of the season, but in spite of that went down 9-0 to Pannal Eagles. Similarly, U15s played well at home to Wigton Moor but were undone during a poor 10 minute spell where they conceded 3 goals, losing the match 6-3. U16s were worthy 5-2 winners in a bottom of the table clash with Nidd. U17sproduced a great team effort to beat league leaders Grassington 4-1 away in a full-bodied friendly. U12s Girls Rockets got their league campaign off to a winning start with a comprehensive 4-1 victory at Ripon. A good all-round performance from the team, and we could have scored more goals. It was a straightforward 4-0 win for U13s Girls Dragons​ away at Poppleton Tigers. Six wins out of six, no goals conceded, and five points clear at the top of the table. U7s played their first ever competitive matches against Wigton Moor at Soldiers Field, losing all 4 games. U9s played a hard fought derby against Wetherby Juniors. Some great football and plenty of goals saw us win all 4 matches. U11s lost 4 out of 4 away at Clifford Juniors. Despite playing some nice football and creating some good chances in the first hour of the game U14s Whites lost 4-0 to a physically stronger New Park Bulldogs side. U14s Blues played a good passing game away at Bedale, but were let down by poor marking and allowing the opposition too much time on the ball. Final score 4-1 to Bedale. U17sbeat Wigton Moor 13-0 away. U10s Girls Kangaroos took part in the Scotton gala. Playing four 15 minute matches in a variety of formats (5 a side, 7 a side, 8 a side) we won two, drew one and lost one. U13s Girls Dragons played bottom club York RI at Grange Park. After going two up in the first five minutes the girls relaxed, eventually scoring again to take a 3-0 win. U18s progressed to the 2nd round of the County Cup thanks to an entertaining 4-2 win against Ossett Town U18s at Grange Park. Deighton opened the scoring after 18 minutes when Josh Quinn scored a 'goal of the season' contender with a glorious shot from 25 yards that flew into the net just under the crossbar. Josh then scored again 10 minutes later when he collected a fine through ball from Sam Monaghan and calmly chipped the Ossett goalkeeper. Callum Unsworth made it 3-0 before half time with a goal to rival Josh's first, scoring with a 20 yard shot from his left foot. ​However, Ossett rallied well in the second half and scored twice to leave a tense last 15 minutes - until a precise pass from KDR midfielder Greg Moodie found Colum Fletcher who calmly finished to secure the vctory. Deighton were indebted to goalkeeper Rowan Bentley, who having suffered a calf injury during the week was able to return to the squad and contribute to the win. U10s played some lovely football against Knaresborough Celtic, recording four good wins out of four. U11​s were bolstered by a couple of last minute signings, but unfortunately the new players were unable to prevent us going down to three defeats, with a solitary win to our credit. U12s were away at Pannal Ash. A good start led to an early goal, but we failed to capitalise on ​​our advantage, and lost 4-1. U13s ​Kinetic started strongly against Beckwithshaw. 2-1 down at half time the boys chased the equaliser​ only to concede a third. As a result of injury we then went down to ​​8 players for the last 10 minutes,​ and the ​extra player helped Beckwithshaw grab a fourth. U13s Dynamos​ went down 1-10 against Lawnswood. U10s Girls Kangaroos ​hosted Scotton Scorchers in their first non gala matches, winning two, drawing one, and losing one. U13s Girls Dragons continued their excellent start to the season with a 10-0 win against Fulford, a team we haven't beaten in​​ three seasons. U8s ​​enjoyed their first ever home competitive game against Ripon. A good KDR win was followed by three very close matches, one was drawn and a couple went Ripon's way. U10s played well and came out on top against Pannal Ash, with two thumping wins, a goalless draw, and a defeat to a single goal, the last game being our opponents first win in three years. U12s were away at soggy Beckwithshaw. Coming back from two down to level at 2-2, the boys attacked the opposition goal a little too eagerly, leaving the defence exposed and allowing Beckwithshaw in to score four more goals for a 6-2 win. U13s Dynamo tough start to the seaon continued with an 8-2 defeat to Beckwithshaw.​U13s Kinetic drew 4-4 with league newcomers North East Leeds. Despite a number of injuries the boys' commitment was excellent, and it was only a couple of unfortunate errors that saw us miss out on the victory. After starting the season with a 6-2 win last week, U14s Whites fell back down to earth with a 9-0 defeat to Guiseley. It was only heroic performances from Jake Levine in goal and Josh Thompson in defence that kept the score down. U14s Blues worked on their passing game in training this week, to good effect in a much improved performance at Leeds Maccabi. Johnnie Binner scored in the second half to put Blues a goal up. Leeds got the ball in the net in the third minute of stoppage time, only to see the referee rule it out for offside. A hard fought 1-0 win, in a game of end to end football. U15s were level at 1-1 with Bardsey until midway through the second half. Alas, we conceded a soft goal and subsequently crumbled, going down 7-1. U17s won 9-2 away at Hambleton, a fine passing performance that earned praise from the opposition. U10 Girls Kangaroos played in a gala at Boroughbridge. Five matches saw lots of goals scored, only a few conceded and happy players at the end. U13s Girls Dragons continued their tough series of opening fixtures at home to last season's runners-up Brayton Belles, who beat us three times over the year. In a tough game against a tough team we scored a goal in each half for a 2-0 win. U10s faced a strong Wigton Moor team away from home. After shaking off the cobwebs we came home with 3 wins and a draw. U11s shared the spoils at home with Wigton Moor, both sides winning two games each. U15s played out an entertaining 3-3 draw with Ilkley. Very much a game of two halves; we should have been out of sight at half time but the opposition had the better of the second half. ​​Despite playing well U16s lost 6-4 at Beckwithshaw. It might have been closer had we not scored two of the goals for our opponents. U17s just held on to beat Nidd 3-2.